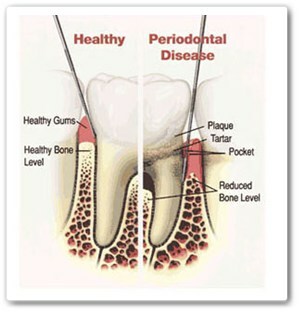 Periodontal disease or so-called gum disease is oral inflammation or infection of gum and underlying bone. 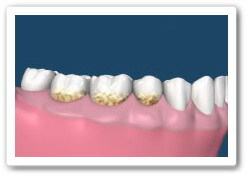 Plaque is harmful bacteria increasing in mass and thickness until they form a film. Plaque's toxic and calculus will attack the mouth defenses. The longer plaque and tartar are on teeth, the more harmful they become. In general, unhealthy gum tissue covers eroded bone, resulting in abnormal pockets around the roots. Left untreated, periodontal disease can result in loss of teeth. It is a common, and sometimes silent, condition in many adults. The bacteria cause inflammation of the gums that is called gingivitis. In gingivitis, the gums will become red, swollen and can bleed easily. Gingivitis is a mild form of gum disease that can usually be reversed with daily brushing and flossing, and regular cleaning by a dentist or dental hygienist. This form of gum disease does not include any loss of bone and tissue that hold teeth in place. 1. Tooth Loss which is caused by loss of connective tissue structures and bone. Gingivitis precedes periodontitis, though it doesn't always lead to severe conditions. In fact, some research suggests it is an entirely different disease. It is a progressive disease that gives little or no pain in the early stages. The disease attacks the gums and bone that support the teeth and, in the advanced stages, may result in loss of teeth. 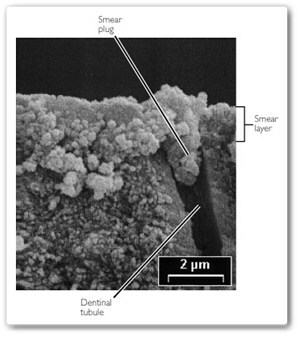 Plaque that is not removed can harden and form bacteria-harboring tartar that brushing doesn't clean. Only a professional cleaning by a dentist or dental hygienist can remove. The process starts with bacteria. Even in healthy mouths, the sulcus is teeming with bacteria, but they tend to be harmless varieties. Periodontal disease develops usually because of two events in the oral cavity: an increase in bacteria quantity and a change in balance of bacterial types from harmless to disease-causing bacteria. When the gums become diseased, it will loosen from the tooth and the underlying bone. 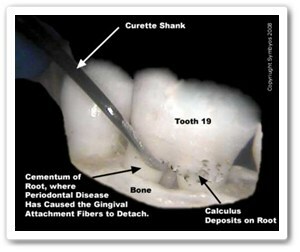 This loosening gives rise to a crevice that is deeper than 3mm is not normal and is called a gum pocket. Gum pockets are very difficult to keep clean. Root planning by the dentist can help to reduce the dept of the rocket. This will make it easier for you to keep the teeth clean and the gums healthy. Remember that Periodontal Disease is a chronic disease. Good home care and regular cleaning by your dentist can control the disease. Cleaning and polishing is the removal of plaque, calculus (tartar), and stains from the tooth structures. Dentist use dental instruments that scrape away deposits from the teeth. This deposit removal is performed on tooth structures that have not been affected by bone loss, typically the crowns of the teeth. Dental cleaning is advised to everyone at least one time a year. However, persons who do not have bone loss, periodontal disease, or infection around the teeth will be took care under dentist advised. There should also be no bleeding, mobility of teeth, receded areas where the gums have pulled away from the teeth, or gaps where spaces around the roots are exposed. In other words, the mouth should be healthy, with no gum and bone problems. This works can be done within one single visit in Pattaya. 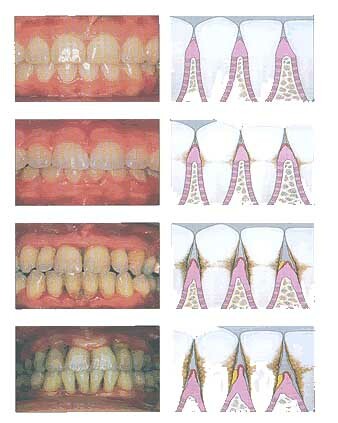 The dentist or periodontal dentist will remove plaques by deep-cleaning method called root planning. Scaling means scraping off the tartar from above and below the gum line. Root planning gets rid of rough spots on the tooth root where the germs gather, and helps remove bacteria that contribute to the disease. Root planning is time consuming works to remove toxins and bacteria from the root surfaces of the teeth. Periodontal disease can be treated with root planning. Removing toxins allows the bodys immune system to begin the healing process. Calculus are also scaled away. These procedures are used as complete treatment in some stages of periodontal disease, and as part of preparing the mouth for surgery in others. We need patients at least 4-5 days staying in Pattaya and several appointments, treating sections of the mouth, and local anesthesia might be required.